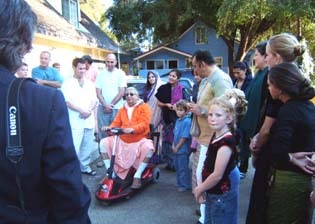 Srila Bhakti Sundar Govinda Dev-Goswami Maharaj. 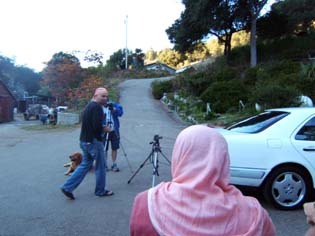 Ketu, "the hollywood dog", as Gurudev calls him, came to pay his respects. 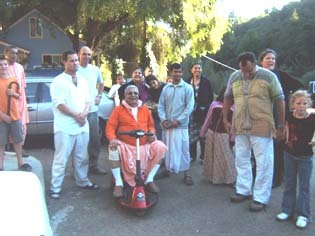 Gurudev rested at the bottom of his house for a while and talked about his "new car." 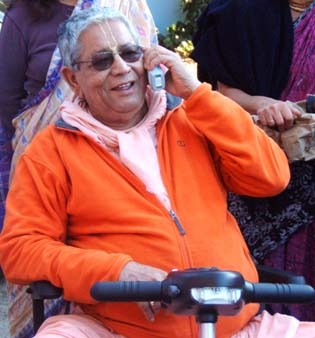 He told Srutasrava Prabhu, his dedicated driver, that he now had his own car and could drive himself. 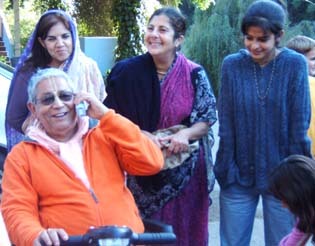 It is so sweet to sit outside with Gurudev and see him smile. He is very jovial and is always making small jokes. 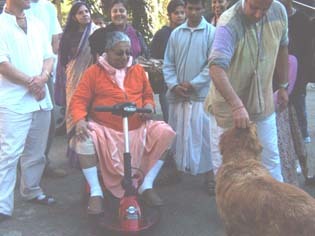 Gurudev came out for a ride when the weather was exceptionally pleasant. There was a small breeze and gentle sunlight. He paused for a very long time to have a look at the trees, the mountains, and the sky. 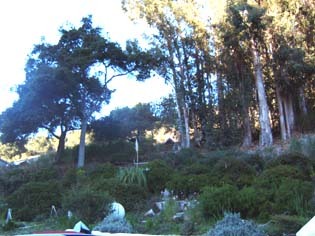 Many different kinds of flowers have been planted near his house to brighten up the hillside. He always mentions how this land is very auspicious and reminds him of Govardhan. This was the second time he drove his scooter today. 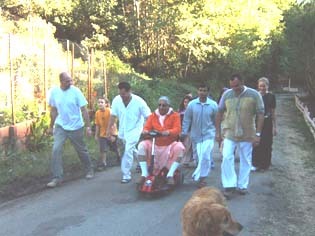 Not only is he benefiting from these outings, but we also are getting our exercise! The next day, Sarvabhavana Prabhu came to make sure that everything was all right with the scooter before it was taken for a ride. After making some adjustments, it was good to go. In the evening, Srila Gurudev was sitting on his veranda with several devotees, and I came to pay my respects since I had not seen him all day. I mentioned that he had gone out earlier in the morning, and then he immediately asked: "Is the Scooter outside?" 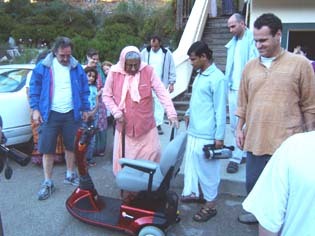 Srutasrava responded, "Guru Maharaj, the scooter is in the car and I can bring it out in one minute." 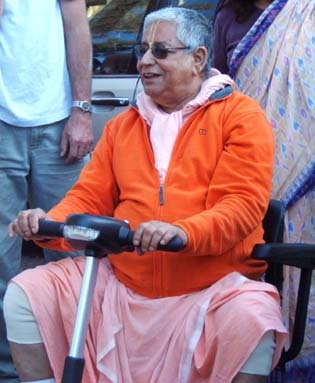 Srila Gurudev seemed very happy about this and put on his coat to go outside again. 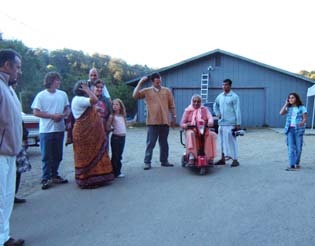 From this point of view Gurudev can see the hillside and the devotees filming and taking pictures. This is the hillside that Gurudev always looks at while resting near his house. 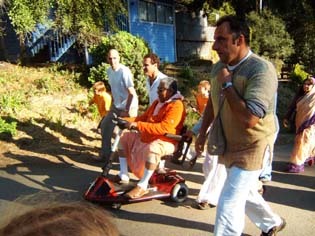 After riding up a steep incline, Gurudev finally reached the top of the hill. 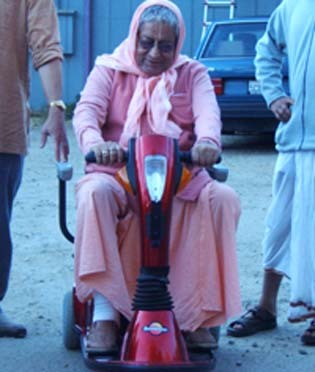 Every time he sped up, the devotees would rush to his side. The women and the children stood in the back laughing while the men tried to make sure he was safe. 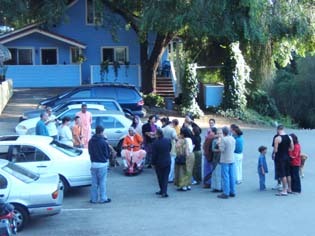 After riding for a while, Srila Gurudev retired to his veranda and we all went back to our seva. In my case, I went back to my computer. 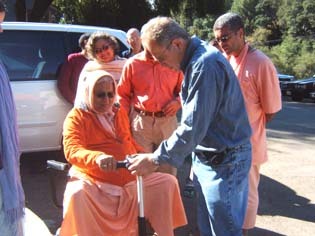 I offer my dandavats to all of the devotees. Please give me the mercy to please you with some service!